Spurs head to Chelsea on Monday night knowing that anything but a win will hand Leicester City the Premier League title. Who will win the clash? 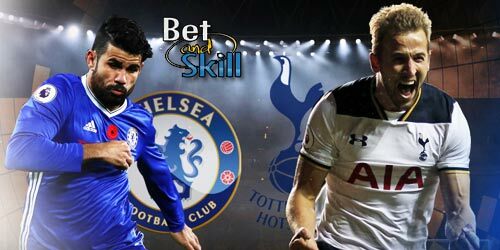 Don't miss our CHELSEA v TOTTENHAM betting preview with free predictions, expert tips, enhanced odds, starting line-ups, free bets and no deposit bonuses on the London Der3by! Chelsea head into the game looking to build on their impressive 4-1 win over Bournemouth last weekend, a match that saw the Blues star player of last season Eden Hazard score his first two goals of the campaign. The Blues lie ninth and they are seven behind Southampton above them. European football will not be coming to Stamford Bridge next season. Spurs sit currently 2nd in the Premier League table and eight points behind Leicester, who earned a 1-1 draw at Manchester United on Sunday afternoon. The Lilywhites are still five clear of Man City and Arsenal and on course to finish second. The north London club settled for a 1-1 draw against West Brom last weekend and that dented their title ambitions. Anyway, they have lost only one of their last 16 away games in the EPL. Mauricio Pochettino will be without Dele Alli for the trip to Stamford Bridge, with the midfielder suspended for the final three matches of the season. Mauricio Pochettino has a number of options to cover his absence, but could bring Ryan Mason into midfield with Mousa Dembele pushed further forward. That could also mean a recall for Heung-Min Son alongside Christian Eriksen and Erik Lamela in the attacking midfield positions behind lone striker Harry Kane. Eric Dier is a doubt after suffering concussion while Nabil Bentaleb (knee) is still sidelined. The Blues managed a 0-0 draw at White Hart Lane when the clubs last met in November. Chelsea have not lost a top-flight home match against Tottenham Hotspur since February 1990, winning 17 and drawing eight of their 25 meetings at Stamford Bridge since. In their last three meetings in West London, the aggregate scoreline reads 9-0 in the Blues' favour. CHELSEA (4-2-3-1): Begovic; Azpilicueta, Ivanovic, Cahill, Baba; Mikel, Fabregas; Pedro, Willian, Hazard; Costa. TOTTENHAM (4-2-3-1): Lloris; Walker, Alderweireld, Vertonghen, Rose; Dier, Dembele; Lamela, Eriksen, Son; Kane. Enhanced Odds! 6/1 Man UTD or 12/1 Leicester to win + £100 bonus! Risk-free! 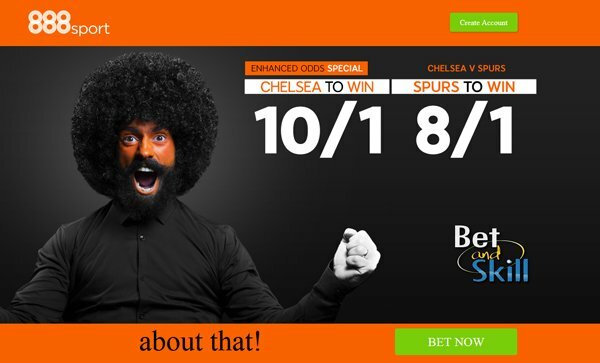 Crazy prices: 10/1 Chelsea or 8/1 Tottenham to win the match! Enhanced price! Get 11/1 Leicester to win + £5 free bet! Price boost! Get 7/1 Tottenham to beat Chelsea! "Chelsea v Tottenham predictions, betting tips, odds and lineups (Premier League - 2nd May 2016)"